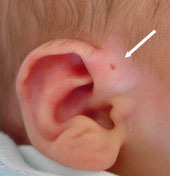 Preauricular Sinuses are developmental pits typically seen at the ‘Root’ of the helix. Both ears can be affected and there may be a familial tendency to this problem. In many cases the sinus may be asymptomatic but it is possible for a blockage to occur and the sinus tract to get infected. This may require antibiotics or surgical drainage. Once a sinus has been infected it has a high chance of a further infection and should be removed while quiescent. Many families will elect to have the sinus removed before an infection occurs to pre-empt a problem. Surgery is a straightforward day procedure.